People across the United States are bracing for the coldest air they’ve seen since late last winter. By the end of the week, nearly every place in the country — even Florida — is going to be experiencing temperatures 10 to 20 degrees colder than average. The jet stream is taking a steep dive southward and bringing some bitter cold air with it. Temperatures have already begun to fall in the western half of the country, and everyone else will begin to feel the freezing weather by Wednesday and Thursday, making this the most widespread cold air outbreak since last winter. The coldest air will easily settle in across Montana and North Dakota where high temperatures won't even reach double digits on Wednesday and Thursday. Even parts of the Florida Panhandle will struggle to make it to 50 degrees Friday afternoon, and Friday night will likely see temperatures dipping below the freezing mark. With the arrival of cold air, snow chances are increasing this week for a number of cities. Lake effect snow will fire up all around the Great Lakes, especially along the snowbelt that spans from Cleveland to Buffalo, New York. Later in the week, a developing system is bringing accumulating snow to the mountains of Colorado before moving east into Kansas and Missouri. This round of cold and snow looks like it'll last, too. 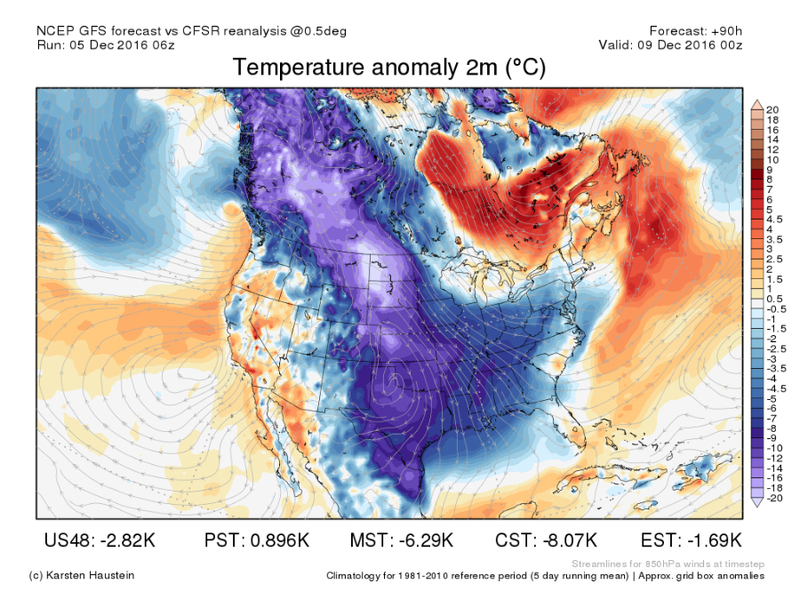 Long-term forecast models have the colder air sticking around through at least the first half of December. Milder air may begin to return to the southern United States for the second half of the month.